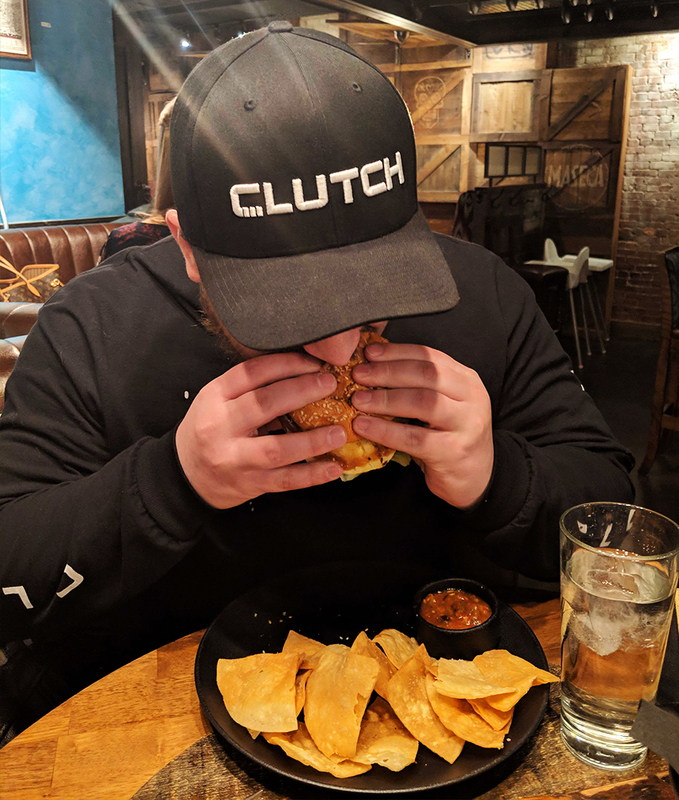 Clutch does burger week again! 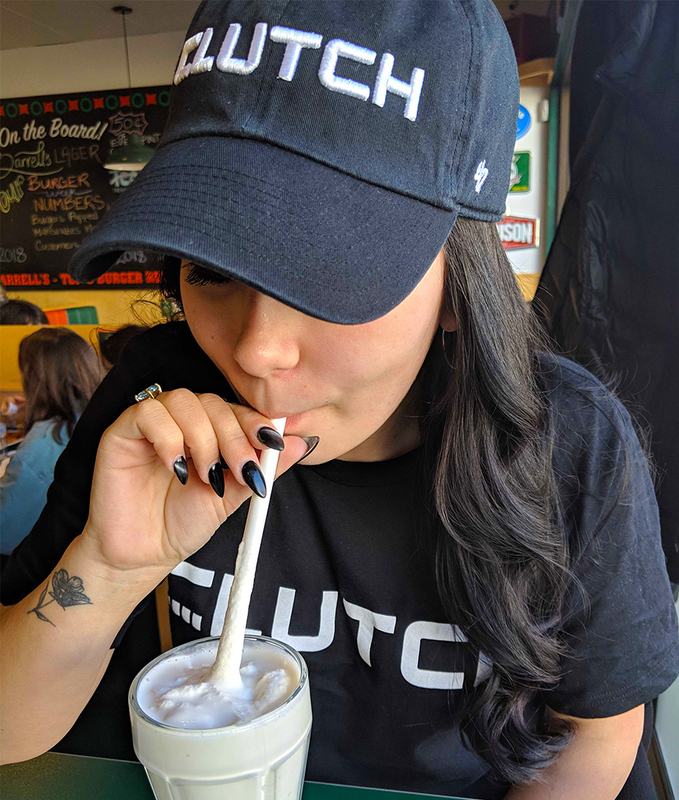 Clutch is getting much busier as more and more Haligonians spread the word of their experience buying a car online and the convenience of booking a test drive to your door. 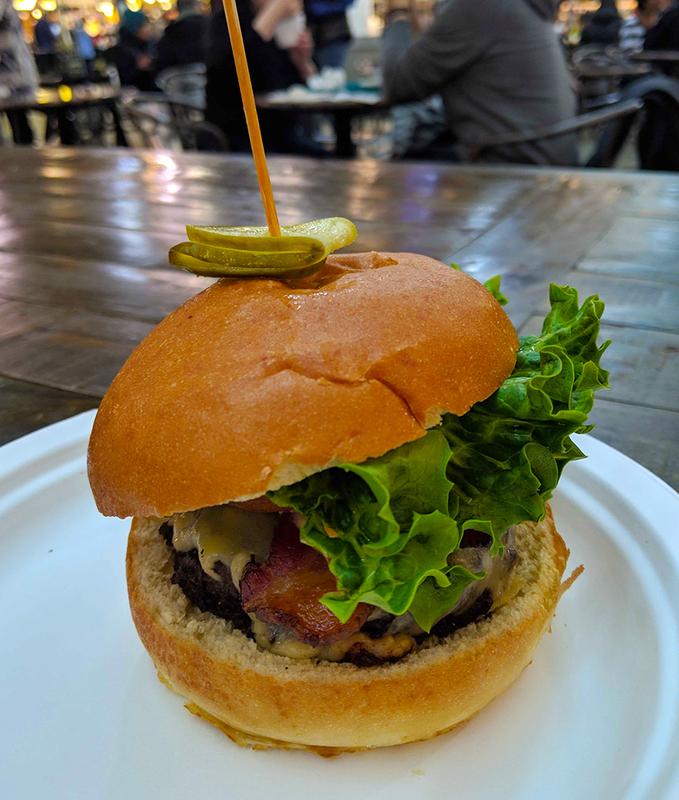 Last year we drove all around the city to see all the amazing burgers Halifax Burger Week had to offer – it was quite the experience! Even though our team has almost tripled since then, we knew we had to do it all over again. There are just too many good burgers out there that need tasting! Lucky for us, many participating restaurants were glad to partner up again this year, so we will be giving away a gift card for every burger we try! (Find the contest on our Facebook page.) 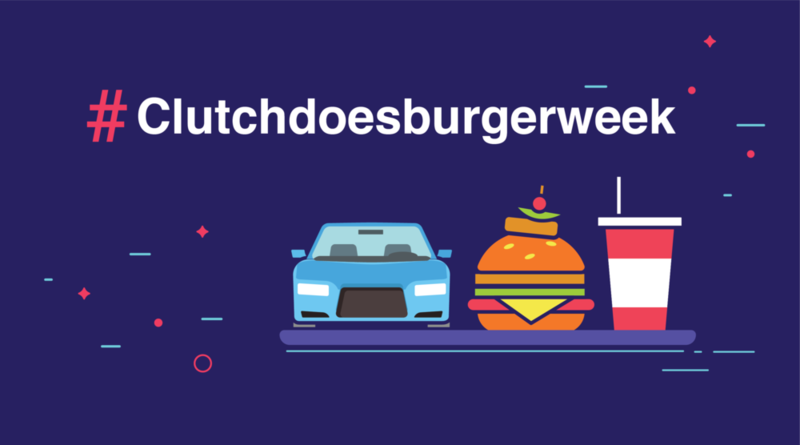 Be sure to check back during the week since we'll be updating this post daily to keep you current on all the deliciousness we encounter on our burger-inspired adventure! 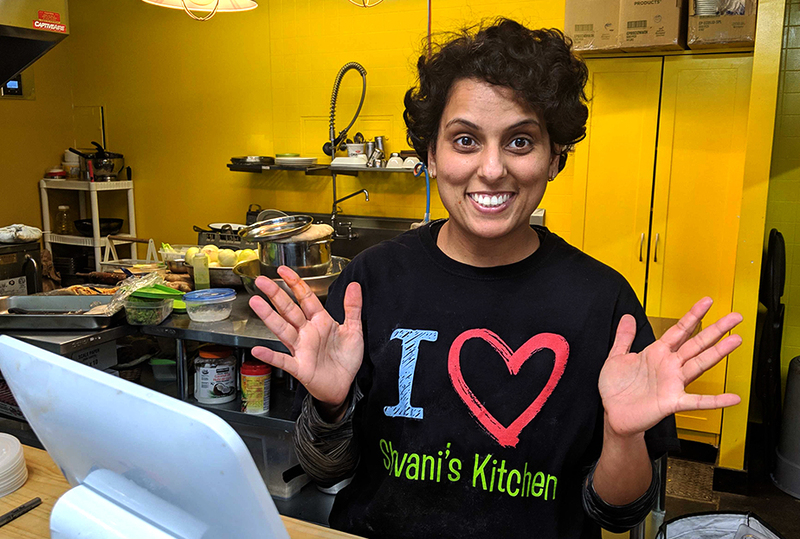 Shivani’s Kitchen is a small Indian restaurant that is big on flavour. You’ll find it in the lively Halifax Seaport Farmers' Market where it fits in perfectly with the diverse mix of food vendors and artisanal shops. It’s a bit hidden on the road-facing side of the market, so once you smell the aroma of Indian spices you’ll know you’re in the right place. I’m a huge fan of India food. Whether it’s tikka masala, palak paneer, or chicken curry – they’re all divine in my eyes. I do have one favourite dish and it just so happens that it was part of Shivani’s Burger Week creation. It smelled so good in here I didn’t want to leave. The Butter Chicken Burger was very authentic in nature: tandoori chicken topped with butter chicken sauce, crisp lettuce and tomatoes, served on a freshly baked naan bread. Shivani definitely had the right idea in choosing top quality ingredients she uses for other dishes. After watching her take the naan fresh out of the oven and piece the burger together it was quite evident that the thought of having more traditional ingredients like sesame seed buns or processed cheese would have been ridiculous. Ben’s diving in for his first bite. The burger was absolutely delicious. It had all the flavour and freshness I was hoping for while being in an easy to eat, grab and go form. 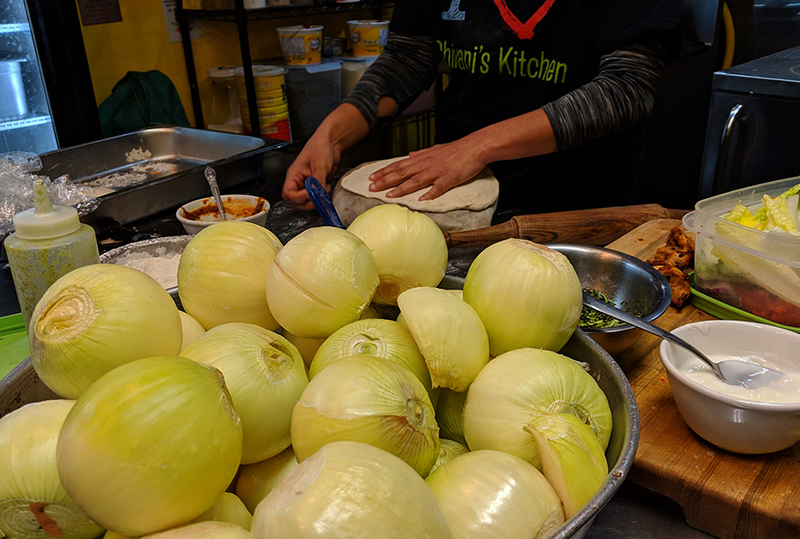 Burger Week may be done for 2019, but the fresh naan bread, butter chicken, and all the other top-notch cuisine can be found year-round at Shivani’s Kitchen! Real Fake Meats is the first plant based butcher shop in Nova Scotia. I’ve (Mélodie) been dreaming of their fake meats since I heard that they were opening up in downtown Halifax. We didn’t even hesitate to choose The Overflow Burger when the Burger Week List was released, simply based on pure desire to try their innovative approach to formulating meat substitutes. As vegans/vegetarians, it’s rare to be able to indulge in specialty food items, such as specialty burgers. Real Fake Meats opens up so much variety to those that choose to adopt a plant-based lifestyle. Shout-out to Real Fake Meats for catering to the community of Halifax vegetarians and vegans. 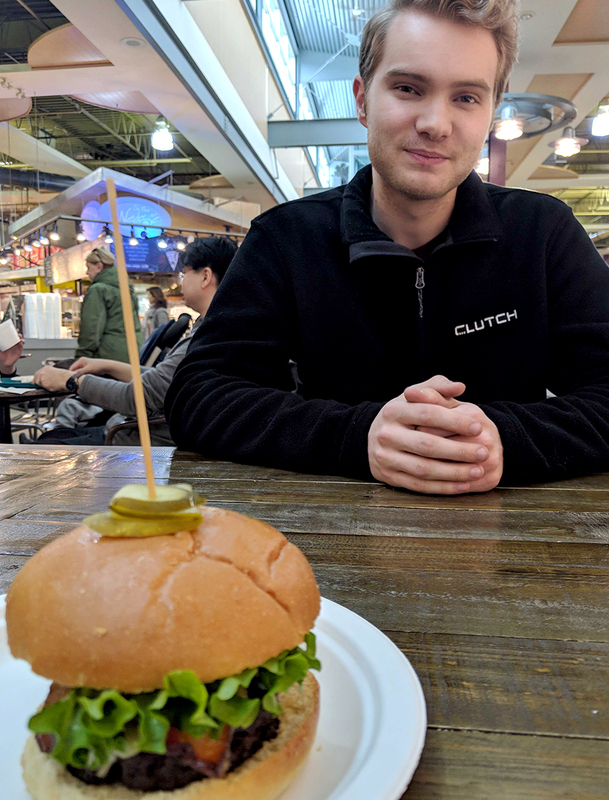 Ashley and I being the resident vegetarians/vegans at Clutch joined Trish to try the specialty burger offered during Burger Week 2019 at Real Fake Meats. The Overflow Burger stands true to its name. Fresh from the kitchen arrives a seitan patty covered with a generous portion of fries covered with a gooey-stringy cheese-like sauce held together by a scrumptious bun. The burger is then skewered together with a delicious deep fried pickle, an apple slice, a raisin chocolate thingy, a peanut butter sweet and a peach gummy. It’s quite a sight to behold. I had to take a selfie with it because of how playful the towering burger presents itself. It’s almost way too much fun to eat. Take a big bite of poutine-burger, and then choose between a bite of sweet or salty from the skewer. I had never had a deep fried pickle before, but it was life changing. It complemented the burger perfectly. I would have wanted more if it wasn’t for all the other add-ons featured on the skewer that almost had my stomach overflowing with plant-based goodness. As we finished eating our burgers at Real Fake Meats, the storefront became packed with hungry patrons. The towering burger is eye candy to anyone passing-by. It seemed that they were likely to sell-out again just as they had done the day before. 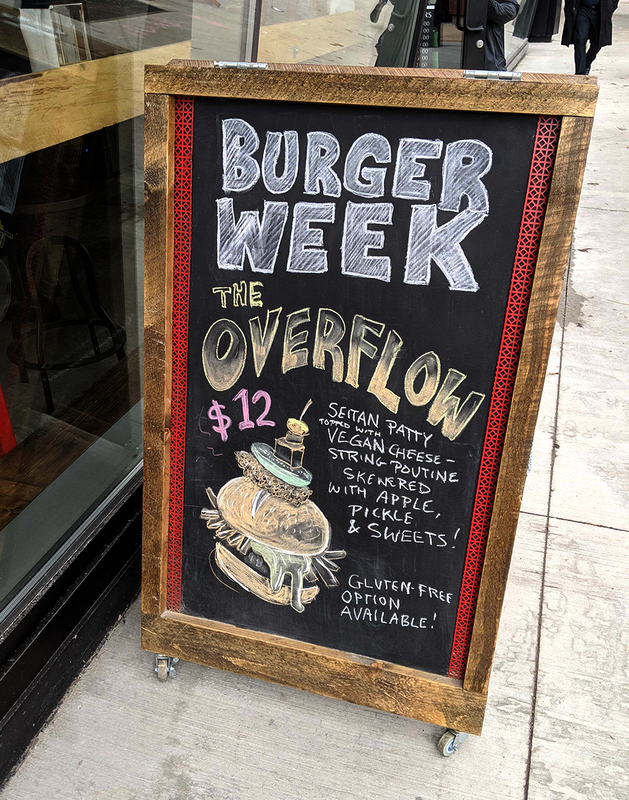 If you haven’t tried the Overflow burger yet, and are curious about fake meats I recommend making the trip down to Real Fake Meats before Burger Week 2019 concludes. As for me I will be visiting Real Fake Meats again soon to discover what they offer on their daily menu. Melodie and Ashley so satisfied with what they just ate! 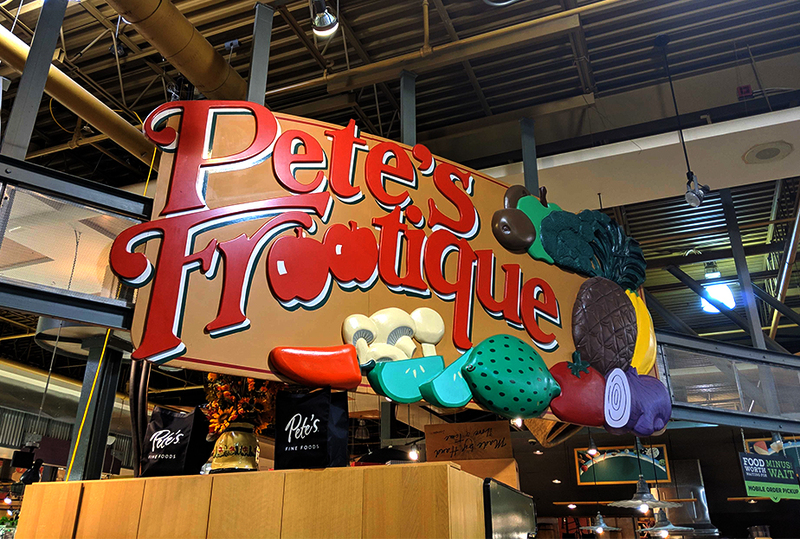 Petes in Sunnyside Mall is a Clutch favourite! 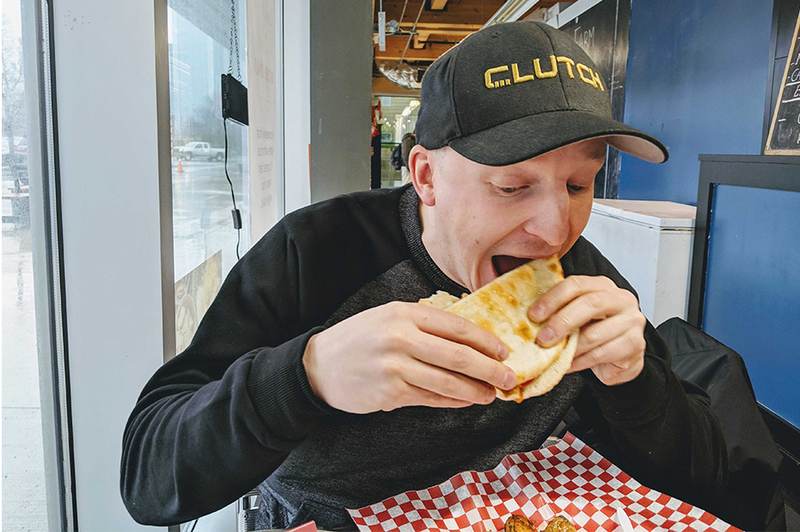 Clutch is located in Bedford so when it comes to lunch time we go there the most. Walking in you always feel the hustle and bustle of the busy mall and Petes itself with options for everyone. Everything they have is local and hearty with a wholesome European vibe in their preperation. Just like their $6 #HFXBURGERWEEK burger, which was loaded with the "good stuff" (strips of bacon and cheese) but still felt light and homecooked. The staff was incredibly organized with getting these out even with a huge demand. We only had to wait a few minutes even with a line. The Smokin' Wagyu Burger had a Wagyu patty that bursted with Umami flavours. It was expertly paired with sweetness of the sweet onion marmalade and the hint of heat from the Sriracha mayo. The smoked applewood cheddar and house-smoked thick-cut bacon brought everything together. It was beautifully sandwiched between a fresh brioche bun that completed the burger, it was fantastic and chances are I will be going there for lunch tomorrow too! Oh yeah! They also have a gluten and dairy free option for this burger making it more available for everyone! In my opinion, (Liam) when it comes to fine cuisine, a person can be in no better hands than an Italians. 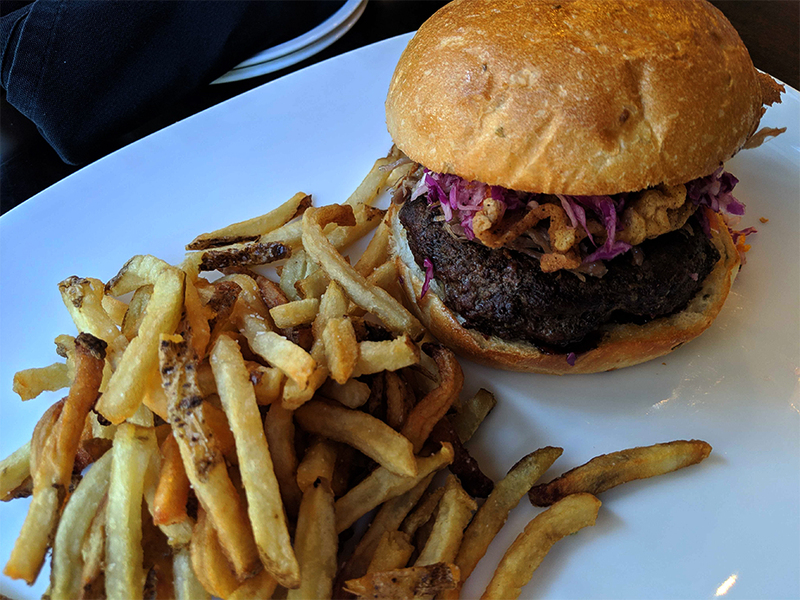 Settled on a quiet street corner, La Piazza is the kind of hidden gem that many might not consider when looking for their next innovative “Burger week” burger. But I can assure you a visit to this lovely restaurant will leave you anything but disappointed. The warm atmosphere and extremely friendly staff was a welcoming appetizer ahead of our journey into diving into one of the best burgers that we would ever try. 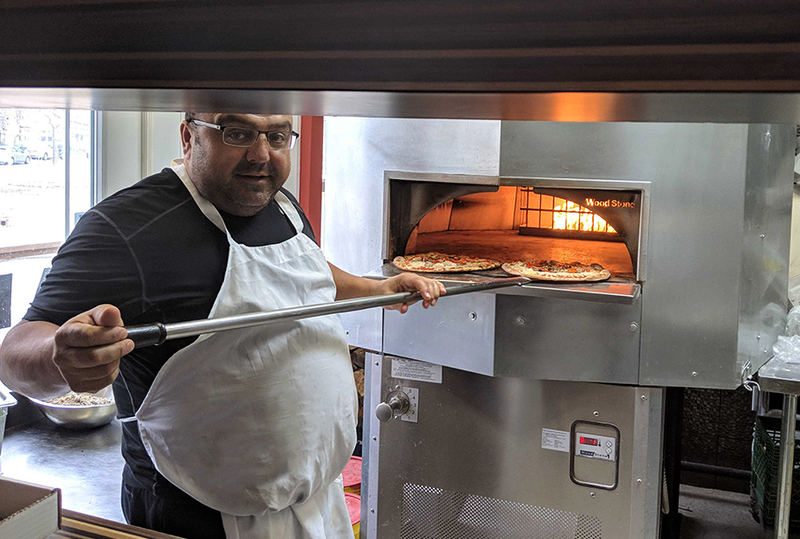 The wood fired oven fills the room with such a homey, cozy scent and the quaint and quiet lunch buzz was refreshing since we're used to a lot of louder and busier spots. Upon arrival, we were greeted by the restaurant’s owner, Albert Zhouri who invited us in and gave us the brief lay-down about the two burgers they had available for this year’s burger week, one was a Shark Bait Burger, a fish burger and the other was your traditional beef patty, the notorious Chef G. I opted for the typical beef patty and my colleague Lochlan, tried the fish. Find our reviews of the burgers below. A fresh, local, ground beef patty that began on the grill and was finished off in La Piazza’s woodfire oven. Nestled on a soft white bun topped with swiss, caramelized onions and a Mediterranean harissa sauce. It’s simple elegance was greatly appreciated in a sea of complicated burger combinations that this event is known for. La Piazza instead took a more focused approach into the quality of the burger’s ingredients as opposed to the quantity of what sorta smorgasbord they could throw in between two buns. The “Chef G” was the perfect friday lunch, an amazing reward after a long weeks work. I’d recommend it to anyone and can’t wait to see what La Piazza has to offer for Burger week in years to come. Lochlan's Review of the "Shark Bait Burger"
The shark Bait Burger which is one of the few fish burgers offered this year, and was it ever the right decision. I typically find fish burgers quite heavily battered but this just hit it spot on for flakiness and retaining the flavour of the fish itself. Paired with the chipotle mayo and some light lettuce just simply did the burger justice, not overdoing it whatsoever. At La Piazza they kept it simple with just extra detail and selection to ingredients and I appreciate that so vastly. Would truthfully recommend La Piazza for anyone this week who doesn’t need all the extra ingredients in their meal, just a darn good burger. DISCLAIMER: I (Alyssa) should start by letting you know I’m an extremely picky eater, as in I eat everything as plain as can be. By that I mean, a hamburger with just ketchup on it, nothing more. However this year, I really wanted to join in and see why everyone loves Burger Week so much! The restaurant of choice for me was Darrell’s, I had been there before but hadn’t been as adventurous enough to actually try their famous Peanut Butter Burger. Judging by the lineup outside when I arrived at 11:30am, I had clearly chosen the right place to start my burger journey this year. I also realized how organized the staff was and how fast moving the line was after we were seated. Switching my focus to the atmosphere, I imediately noticed the buzz coming from the restaurant’s happy customers enjoying their burgers and milkshakes. Therefore I had to order a milkshake to go along with my burger and Darrell fries. The service was very friendly, and the food came out of the kitchen within 15 minutes of ordering. I took one look at the burger and thought “wow, am I really about to eat peanut butter on a burger” being the picky eater that I am, but after taking the first bite I realized why this is on the menu. The flavours of the beef patty, bacon, cheese and most importantly the peanut butter, was definitely an amazing combination which was levelled out by the crisp lettuce and tomato. All in all, this burger absolutely blew my taste buds away and would definitely recommend making Darrell’s one of your stops! 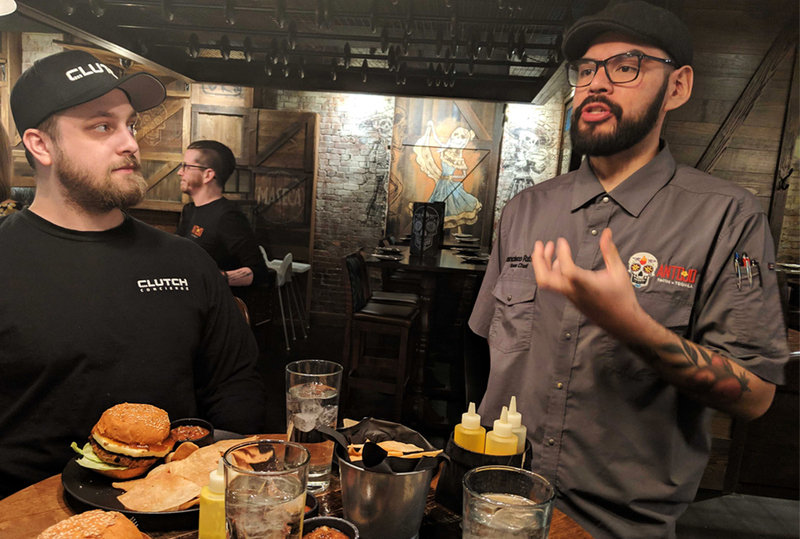 This was my first Clutch Burger Week experience, and after hearing about the feast Fil and Patrick had at Barrington Steakhouse the day before it would be an understatement saying I was excited to get started. 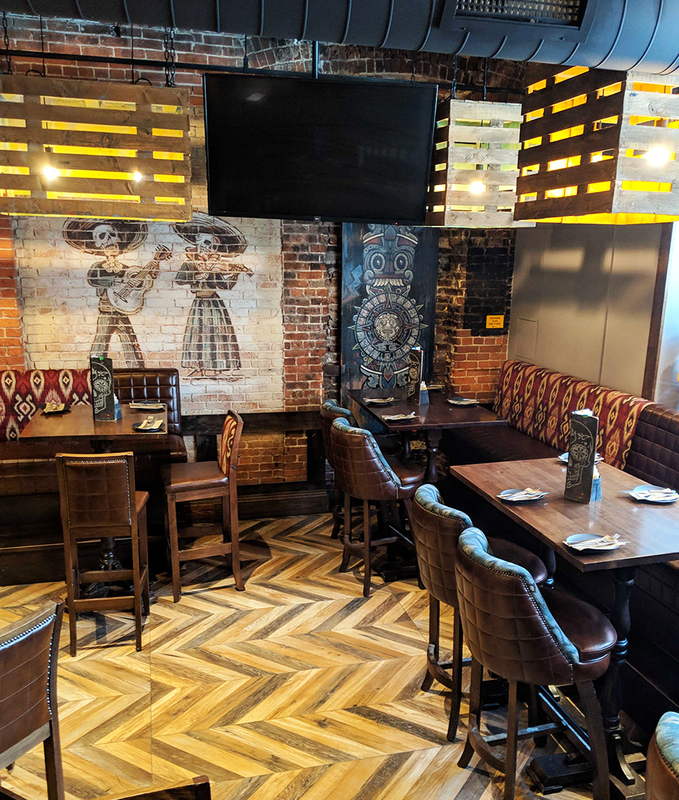 Antojo Taco & Tequila is located on the beautiful and lively Argyle Street, right across from the new Convention Centre and the Mexican theme really makes it pop out from the rest of the bars and restaurants on the street. Once entering the restaurant I was instantly welcomed by the friendly staff and had a quick chat with the manager as well as the lead chef about the burger, the Al Pastor. Antojo’s head chef giving his tantalizing description of the inspiration behind the delectable Al Pastor. After a full description about the burger I knew that I was going absolutely love it after the first bite. Once I had the burger set down right in front of me I was amazed by the look and display of the entire plate. The Al Pastor is “Getaway Farms pork shoulder, anato seed and recado roja seasoning, morita tomato jam, grilled pineapple, cilantro lime aioli, served with house-made totopos and tatamada salsa on a 24 Carrots Bakery torta bun” as described on the Burger Week website and it is exactly that. This was my first time at Antojo and I will definetly be back for the Totopos, array of salsas & hotsauces and to try every burger on the menu. I Highly recommend you add this one to your #HFXBurgerWeek itinerary. 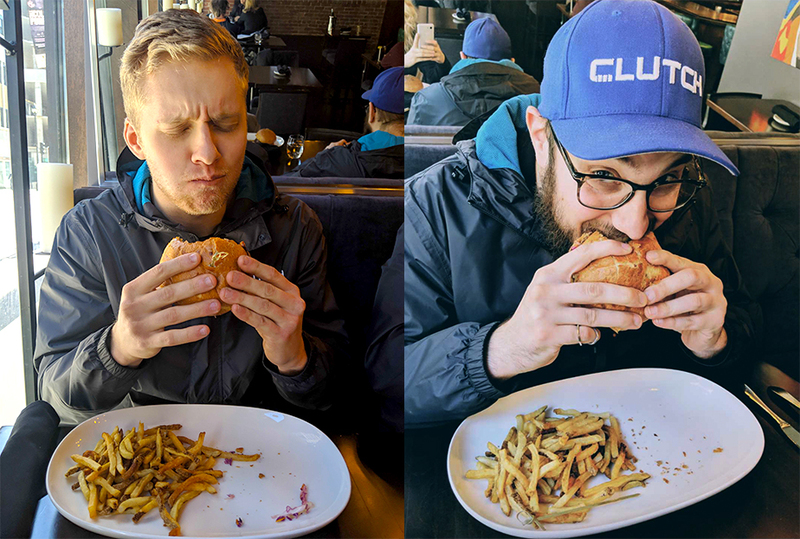 I (Fil) had the pleasure of being the first member of the Clutch team to try out any of the magnificent burgers that all Haligonians will try during Halifax Burger week. I had never been at The Barrington Steakhouse and Oyster Bar but had driven by numerous times on test drives, so I was more than excited. That excitement soon doubled once I got in the door. First of all, the atmosphere was off the charts. 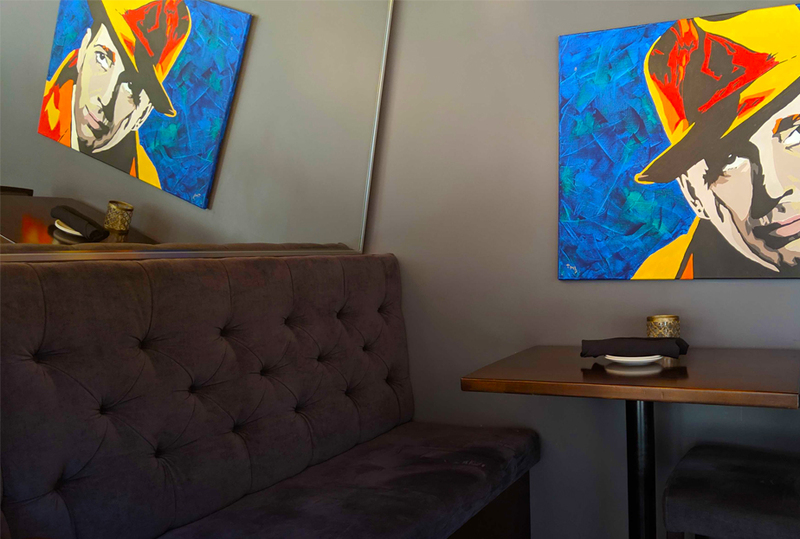 Quiet with ample lighting along with a relaxed and friendly staff made the experience feel elegant – well, as elegant as eating a triple meat burger can be. But all that aside, what you really want to hear about is the burger. Oh boy, the burger. The “Burg-Ducken”, a holy trifecta of some of the world's greatest meats including beef, duck, and chicken. Packed in with a zesty citrus slaw, a pinch of cilantro, and a tangy hoisin sauce... by the end I was begging my coworkers to have an extra bite of theirs (they gave in.) The final result was an effect on my body that reminds me of turkey dinner at mom's house – so nice and soothing that you’ll want to cuddle up and take a nap afterwards. I would definitely suggest this delicacy to any burger fan who loves the taste of any of these ingredients alone, because once you throw them all together and put a bun on top, a masterpiece is created.